Ostuni, Locorotondo, Alberobello, Polignano a Mare, Salento, Lecce, and more! 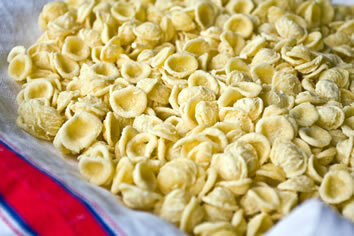 Join Italy Gay Travels for a Culinary delight in Puglia the South of Italy. Our authentic and extravagant Gay Puglia Foodies Tour is a once in the lifetime opportunity to explore the world-famous food in this amazing location. Our tour combines the must-see sights of Puglia with a sophisticated exploration of the food and wine specific to the region. Think seasonal vegetables, local cheeses, seafood from the extensive coastline and amazing meat, this is not Italian food as you know it. 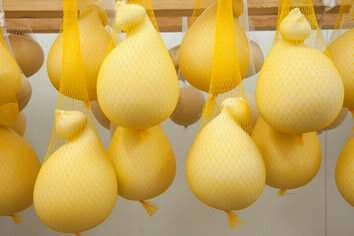 Puglia cuisine is based on a Mediterranean diet but here the food is explored creatively and always on seasonal produce. 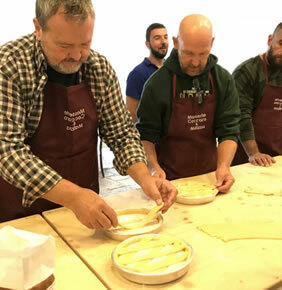 During the Gay Puglia Foodies Tour you will create inspired dishes with local chefs, learning all the tricks and trades from centuries of passed-down traditions. You will also eat like kings on this tour as the gastronomy included will ensure you indulge. Not convinced? 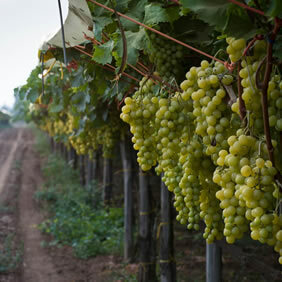 We also throw in trips to food producers, regional markets, wineries and olive groves. 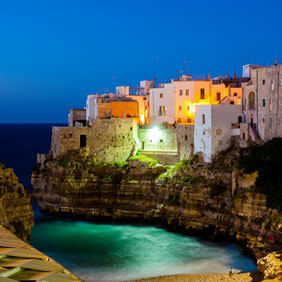 We also see the key sights of Puglia, such as Alberobello, Lecce, Ostuni and Polignano a Mare. This Gay Foodies Tour is open to all levels of cooking: you will be learning about the amazing Pugliese kitchen so there is a new trick for everyone to learn! The Gay Foodies Tour also offers an onsite massage therapist for those wishing to unwind and relax if the cooking gets to hot! 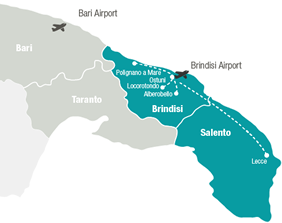 We will collect you from either Bari or Brindisi, international airports which have many connections to Europe and beyond. From there we make our way to the Masseria (large historic farmhouse). Here the Gay Foodies Tour adventure begins! The Masseria has been painstakingly renovated and has all the bells and whistles you’d expect from a boutique hotel: Wifi, swimming pool, terrace sundowners to name a few! Set amongst olive groves and fruit trees, the stunningly refurbished farmhouse tells the story of Puglia’s past and present. The evening is finished with a delicious aperitif dinner prepared by your hosts. After a fresh breakfast and dip in the pool (if you fancy) we have our first experience. A cooking lesson from a local chef. Here you will obtain first-hand knowledge from a master. The focus is on cooking typical regional dishes and also exploring the types of ingredients used and their provenance. 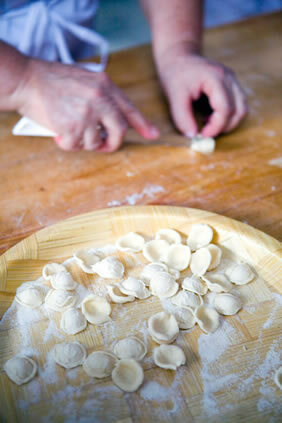 Cooking in Puglia is at a very local level and differs from season to season. They also have a waste not attitude so don’t be surprised to see parts of vegetables used that are generally thrown away. Recipes have been handed down from generation to generation and truly represent the Mediterranean diet. The session is hands on and time is taken to ensure that everyone is happy and confident by the end of the experience. Naturally we eat what we’ve made. After a hearty breakfast we depart for our first stop, Alberobello, a UNESCO World Heritage site. This town is postcard famous for its circular cone-shaped buildings called ‘Trulli’, truly marvellous. Wander the narrow streets with limestone dry-stone walls and get lost in the fairytale ambiance. Here we learn about the history of these buildings and about the cryptic symbols painted on the roof-cones. Many of them from Pagan descent. Afterwards we head to Lecce, the capital baroque city of the southern part of Puglia known as Salento. We have lunch in the historic centre at a restaurant that showcases the local produce. Salento cuisine is quite different and we will try local dishes including ‘ciceri e tria’ (chickpea dish). Soon after lunch we will meander through the key sights and interesting history of Lecce.The baroque buildings and ornate decorations covering the building facades, surrounded by city walls built in local limestone give this city a unique appeal. It is no wonder Lecce is known as the Florence of the south. As well as the architectural and historical features, Lecce is an upmarket town with trendy boutiques and cafes, piazzas filled with gelaterias and local pastries. Try sampling the pasticciotto, an almond flour pastry made here. You will have free time to discover the city and its local talents. A culinary tour in Italy would not be complete without Pizza! This we will have for dinner followed by drinks in the local gay bars of Lecce. Olive Oil Experience and Farewell Partying with the Locals! After a hearty breakfast, we head to a typical ‘Frantoio’ (farm producing organic extra virgin olive oil). Here we will learn the history of the ancient olive groves planted by the Romans and their uses from then until now. Marvel at the ancient trees that dominate this landscape. This is followed by a degustation of olive oils. The afternoon is spent back at the Masseria. Here we get back into the kitchen where we prepare a dinner, this time we are inviting the locals so we hope your skills have upped a notch or 2! The Italians are very honest! We will then spend the evening having a party with the locals around the grounds and swimming pool of the Masseria. • Prepare a seafood meal with our chef – a key part of Puglia cuisine. • Dine in a Michelin star restaurant. • Explore the top cities in the area, Lecce, Alberobello (a UNESCO World Heritage site), Martina Franca, Locorotondo, Ostuni and Polignano a Mare. 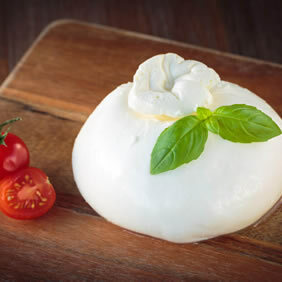 • Local Cheeses such as burrata, caciocavallo, pecorino and caccioricotta.